My entrepreneurship SAE’s consists of growing 35 acres of corn and soybeans– rotating them annually and raising pigs to show at the county, district, and state levels. In addition, I work seasonally at Fahrmeier’s U-Pick and Produce Market, where I manage the patch, market, and public relations. 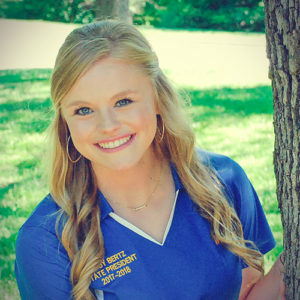 During my year of service to Missouri FFA, I hope to help FFA members from the farthest points of the state and between to find their voice, passion and love for the FFA and agriculture industry. I desire to aid FFA members in finding their niche, while giving them the materials necessary to reach and surpass their potential. It is my hope that I can show them that they are an integral part of this organization and that they have a talent and purpose that can make a positive and unique difference. Growing up in a tight knit family, I have learned the value of knowing your roots, respecting them and cherishing those who helped form them. My grandpa held a high standard for his family and even those around him. He held great value in being a good caretaker of the land, good family member and good community member. He encouraged scholastic success,and encouraged us to constantly seek our full potential. His expectations were high, but his love was deep. Grandpa showcased this love, diligence and compassion in his everyday actions. It is my sincerest hope that he may look down and be proud of the hard work, love, diligence and compassion that drive my actions. After graduating from the University of Missouri with an Agricultural Economics and Science in Agricultural Journalism degrees, I hope to work for an international agriculture business firm. In doing this, I plan to help showcase the diverse markets that agriculture around the world has to offer. Agriculture is everywhere, and I am passionate about sharing, celebrating and communicating it across the globe. If you happen to see another gal with similar features as me, there is a likely chance you have met my identical twin sister. By ten minutes, I am twin A. Alli and I are each other’s biggest fans, best friends and stiffest competition. My womb-mate and I are separating this fall as she is heading to K-State to further her education as a Wildcat and I will be off to Columbia to be a Tiger. My advice to you, my friends, is you not only involve yourself in every possible opportunity that comes your way, but you also take the experiences gained from those opportunities and share them with others. Here in Missouri FFA, if we share our love for our industry, our commitment to cultivating a bright future and the experiences within our organization that have impacted us for the better, we will continue to blaze a clear path for our and the future generations. It’s on us.